The Colors Of Indian Cooking: A Keeper For Summer Weekends, Roasted Pepper Salad With Peanut Dressing. A Keeper For Summer Weekends, Roasted Pepper Salad With Peanut Dressing. We're still in the midst of our house renovation here in Sonoma, target date for completion is mid July, and I'm nearing the tipping point. Most days finds me Googling plumbing and lighting info or working in the garden getting things ready to set up the growing beds and readying space for fruit trees. I think the chickens may be part of phase two as I don't think I could do more research into poultry housing, I'm having enough trouble with my own. I'll be so glad when all this is over and we can get back to our real work which contrary to how things may appear in real life is not LED experts, but writers. I also am eager to get into my new kitchen and get back to a regular schedule of cooking with all my tools close at hand and not scattered amongst boxes marked "Fragile". So I'm still cooking in my borrowed kitchen and so as not to get too messy, I'm leaning toward Indian dishes that are fresh, fast, and above all easy. 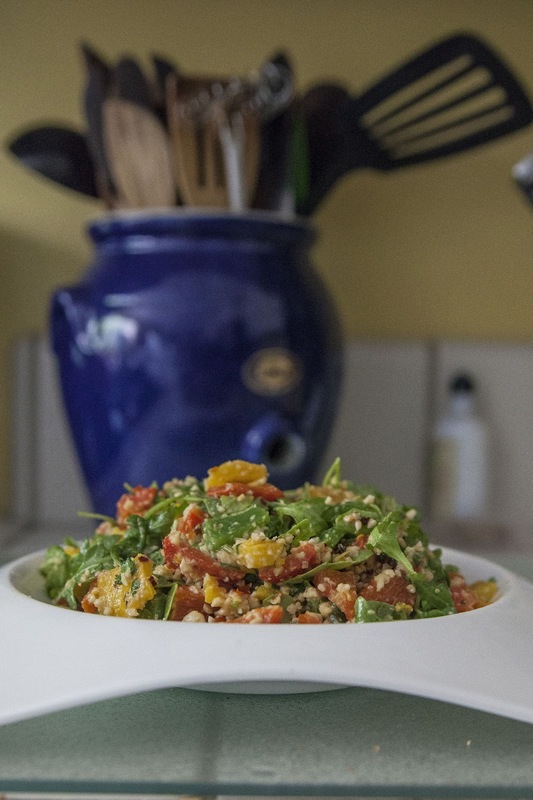 Enter the late great Indian chef Tarla Dalal and her Roasted Pepper Salad with Peanut Dressing. 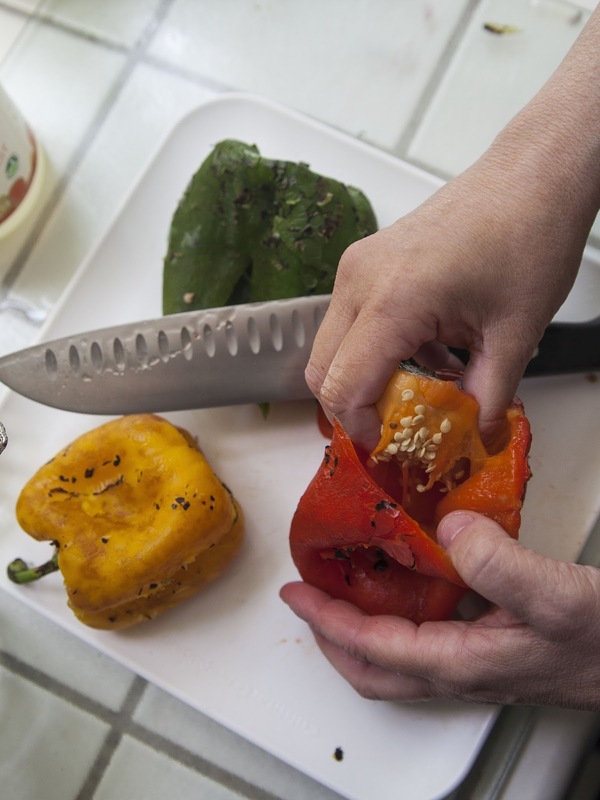 Most people seem to like roasted peppers, and rather than buying them canned or out of a bottle, it's easy to make them at home whether one uses a gas flame, barbecue, or the broiler of the oven. Lightly rub the peppers with vegetable oil and either place them on a baking sheet under the broiler, or on the grill or as I did on a low gas flame on top of the oven. Keep the flame low, and keep turning the peppers till they start to char. 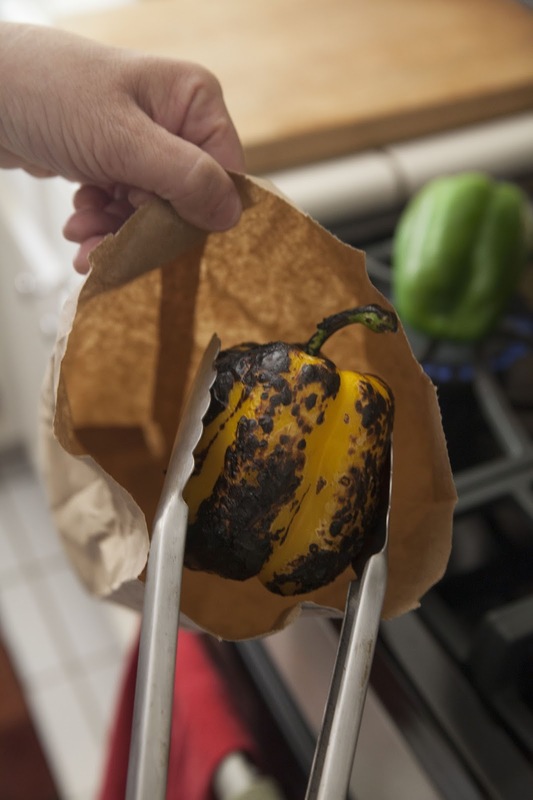 When each peppers skin is blackened, drop it into a brown paper bag and seal it tightly. Keep the pepper in the sealed paper bag for about 10 minutes. After 10 minutes take the pepper out and rinse it under cool running water, while rubbing the charred skin off. When the blackened skin is gone, pat the pepper dry and seed it. Chop the pepper into strips and then squares. Add the arugula on top of the roasted peppers. Now, a note about the arugula. Tarla Dalal in her original recipe uses alfalfa sprouts. I didn't see any that morning, so I decided to use some fresh baby arugula. Another good possibility might be pea shoots. Actually whatever green appeals to you as peppers go with nearly everything. Put the 1/2 cup of peanuts into a grinder and crush them up. The chopped fresh cilantro, lemon juice, and the red peppers. Then mix the Peanut Dressing into the greens and peppers. If you need to add a bit more olive oil it's perfectly ok. 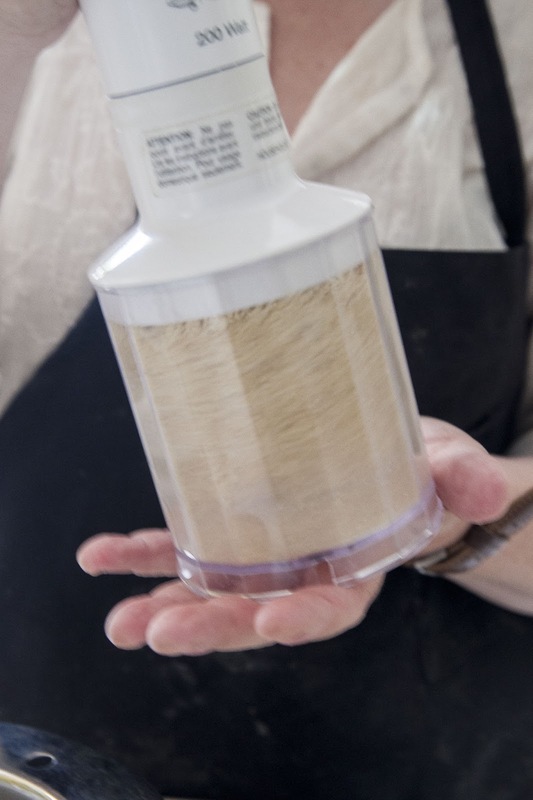 When it's all blended together well serve it up and enjoy. This salad can be made ahead and served at room temperature, but actually for better flavor, it's best to serve it right away. nice colorful and healthy salad.. So impressed you're keeping up with cooking and blogging among all the other goings on! Please do give us a *full* report with photos when the kitchen's done! Thanks Frank, It's not easy. Using a borrowed kitchen, my own kitchen is a series of pipes coming out of the wall and CSI like chalk marks to show where the island will go.